It’s recently emerged from BBC Watchdog that a group of fraudsters are sending phishing emails, posing as the DVLA and asking motorists to fill in their personal details online. Motorists have reported receiving an email that states they are due a vehicle tax refund of £239.35 and to click in the email to access a secure web form. 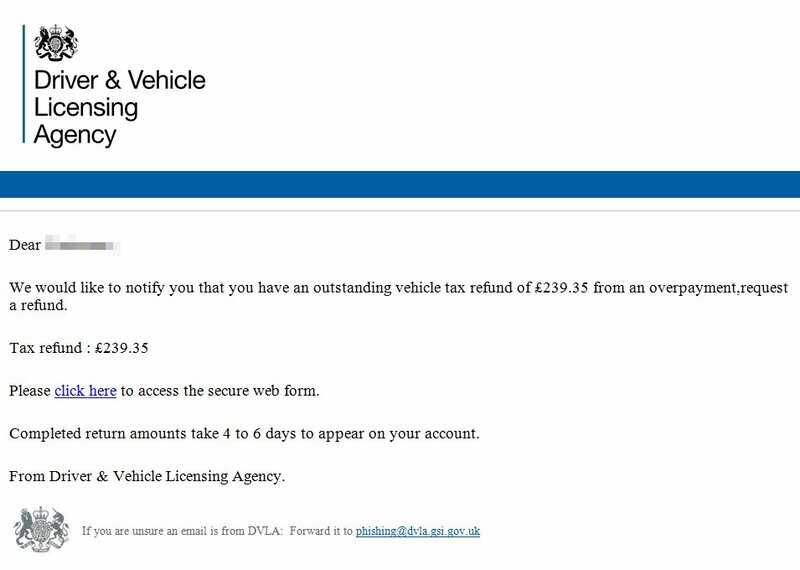 The email could look convincing to those who aren’t aware of things to look for out and features the DVLA logo. It even includes an email address to forward the email to if you suspect it is a phishing email! With the recent changes to vehicle tax bands, the scam is perfect timing and there are fears many motorists could fall for it. This isn’t the first time motorists have been targeted: in 2014, a lookalike website was set up that charged customers extra money to book their driving tests. In the last two years there has been a huge increase in the number of reports of text and email scams to the police. This email is one of the newest scams out there. We want people to be aware of phishing/scam emails, so we have a handy checklist for you to consult, should you ever receive a suspicious email. Mismatched URL – If you see a link in the email, you can double check where the actual hyperlink takes you to by hovering your mouse over the link. If the hyperlink is different to the one that is displayed, then don’t click the link. Poor spelling and grammar – if you can see obvious spelling and/or grammar mistakes, then it’s very likely the email you’ve received is a scam or phishing email. The message asks for personal details – Anytime you are asked to provide personal or account details online be very aware. This is not the usual protocol for most businesses, especially when asking for bank details, online banking details etc. Email address is different – Although many modern phishing emails will include an email that looks like it is from the DVLA, there will be a second email included in the ‘From’ part, which is what you need to look out for. If you are suspicious about an email, don’t click any links or attachments in the email until you have verified where it has come from!